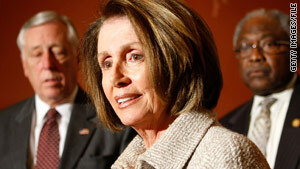 Nancy Pelosi says she doesn't see health care reform failure as a possibility. Washington (CNN) -- House Speaker Nancy Pelosi insisted Wednesday that Congress will pass a health care reform bill, despite recent setbacks that have raised new questions about the changing political climate. Democratic hopes to get a bill to President Obama's desk before his upcoming State of the Union speech were derailed by the GOP's upset win in last week's special election to fill late Sen. Ted Kennedy's seat in Massachusetts. The win stripped Democrats of their 60-vote Senate supermajority and gave Republicans enough votes to block most legislation in the chamber. Democrats, who were in the process of combining previously passed House and Senate bills, have been struggling to come up with a new legislative strategy. "I don't see [failure] as a possibility," Pelosi said. "We will have something." The current health care system is "unsustainable," she said. "We will make progress. Whatever it is -- one way or another -- we will go forward." Democratic leaders are now working on a plan for the House to pass the Senate bill, along with a separate package of changes in the Senate plan that reflect compromise between the two chambers. Some conservative Democrats have been pushing House to approve the current Senate bill unchanged. Doing so would prevent the newly reconstituted Senate from having to take up the measure again. Last week, however, Pelosi asserted that the Senate bill has too many unpopular provisions to win approval from the House if it is not accompanied by a package of changes. Pelosi said the Senate bill has "certain things that [House] members just cannot support." She cited a provision worked in by Nebraska Democrat Ben Nelson that exempts his state from paying increased Medicaid expenses, and a 40 percent excise tax on insurance companies that provide the most expensive health insurance coverage. Meanwhile, multiple Democratic sources say House Democrats were considering holding a series of health care votes on some of the most popular -- and populist -- provisions in their bill. The goal would be to more sharply focus the health care debate by voting on specific parts of the large bill that most resonate with voters. Examples could include giving the Secretary of Health and Human Services more authority to force drug prices down, and repealing the anti-trust exemption for insurance companies. According to Democratic sources, the House Democrats realize the Senate may not follow suit, and the smaller bills may not have a chance at becoming law. They said the idea reflects a desire to keep momentum going on health care reform in the short term. In the Senate, some liberal Democrats have urged Senate Majority Leader Harry Reid to use a legislative tool known as reconciliation, which would allow certain components of the health care bill to pass with only 51 votes. Some Democratic sources warn, however, that using reconciliation is complicated and fraught with legislative hurdles, raising questions about whether it could happen even if enough congressional Democrats supported the move. Other Democrats in tough re-election fights worry voters will see such a move as legislative gimmickry, reinforcing complaints that Democratic control of Washington has been business as usual. On Tuesday, two moderate Democratic senators facing re-election battles this year -- Indiana Sen. Evan Bayh and Arkansas Sen. Blanche Lincoln -- said they would oppose the use of reconciliation in the health care debate. Bayh called the move "ill-advised." Lincoln released a statement saying she will "not accept any last-minute efforts to force changes ... through budget reconciliation, and neither will Arkansans." However, two other Senate Democrats -- Nelson and Finance Committee Chairman Max Baucus of Montana -- have expressed a willingness to consider using the reconciliation process. Newly empowered Republicans, meanwhile, have shown little interest in reaching a compromise with Democrats on the bills currently under consideration. A group of conservative House Republicans introduced a "Declaration of Health Care Independence" Wednesday that slams the "imposition upon us of a new, Washington-controlled system of government-run health care." The document says Republicans are "repulsed by [Democrats'] blatant political bribes and kickbacks" in crafting health care legislation. Among other things, it says any bill must "protect as inviolate the vital doctor-patient relationship," not add to the national debt, reject new mandates, ban new public health care assistance for undocumented immigrants, and "protect taxpayers from compulsory funding of abortion." Obama admitted during a town hall meeting in Ohio last Friday that the health care reform effort had run into a political "buzz saw." "The long process of getting things done runs headlong into the special interests, their armies of lobbyists and partisan politics aimed at exploiting fears instead of getting things done," he said. But, he promised, "I'm going to keep up the fight for real, meaningful health insurance reforms." Obama, who made health care his top domestic priority last year, will address the issue in his State of the Union address, White House press secretary Robert Gibbs said Tuesday. CNN's Dana Bash, Alan Silverleib, Deirdre Walsh and Tom Cohen contributed to this report.